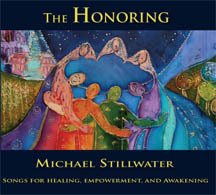 Experience a unique musical healing ceremony designed to celebrate and honor the human spirit, with The Honoring, created by award-winning songwriter, recording artist, and filmmaker, Michael Stillwater. Michael celebrates the idea that in each person, behind the surface story and personality, lies a pure soul that is worthy of being honored. By recognizing and celebrating the beauty in each person, we access the healing power of compassion and empathy and, ultimately we heal ourselves and recognize our own beauty. Stillwater's chants and healing songs are enjoyed by listening audiences and in singing circles, gatherings, churches, communities, hospitals, and patient care settings. Themes of healing, empowerment, relationship, and awakening are woven throughout every song.